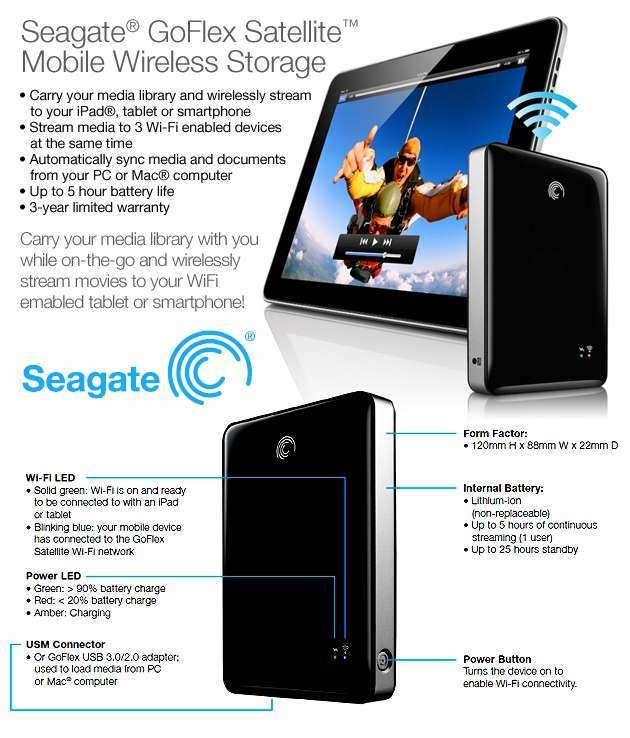 The Seagate STBF500101 GoFlex Satellite Mobile Wireless Hard Drive allows you to carry your media library with you while on-the-go and wirelessly stream movies, photos, music and documents to your iPad?, Android tablet or smartphone. The Seagate STBF500101 GoFlex Satellite Mobile Wireless Hard Drive includes a fast USB 3.0/USB 2.0 connection and downloadable Media Sync software to easily transfer media and documents from your PC or Mac? computer. The Seagate STBF500101 GoFlex Satellite Mobile Wireless Hard Drive can store over 300 HD movies, so you?ll never have to worry about runnin g out of space on your tablet or smartphone.